Tim Lynch used a donut to coerce an autograph out of future All-Star Lorenzo Cain. 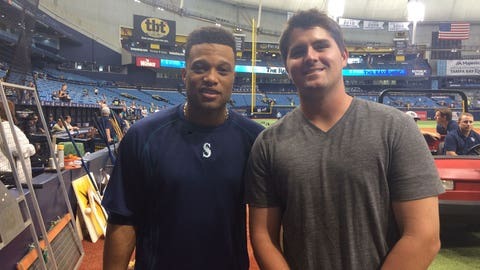 Cain, playing for the Brewers’ Class A Brevard County affiliate in the Florida State League, was years away from becoming an All-Star center fielder for the Royals. But at that moment, he was waiting for a payment from Topps, the owner of Bowman. His agent at the time, Joshua Kusnick, had advised him not to sign Bowman cards during the delay. Lynch said that Cain would joke with him and his friends at Roger Dean Stadium in Jupiter, Fla., sign photos, baseballs, anything else they wanted. But the cool thing to do, Lynch said, was to get the entire Bowman set signed. And one Sunday morning, while eating breakfast at Dunkin’ Donuts with his mother, he had an epiphany. "He kind of had a big old smile on his face. He ended up signing the card for me, and for a couple of my buddies. He said, ‘Man, I love these marble frosted donuts, so I can’t turn you down.’"
Cain vaguely remembered the exchange, saying with a chuckle, "I’m almost sure it happened." Ford, an outfielder with the Giants’ Triple-A Sacramento affiliate, offered more of a confirmation, saying, "I remember getting some donuts in Jupiter. He definitely gave me and LoCain some." Funny thing, though, about Lynch — he grew up to be an actual player, the first baseman at Southern Mississippi. And last Friday, the Yankees selected him in the ninth round of baseball’s amateur draft, making him the 278th pick overall. "That’s unreal," Cain said. "A guy that was asking for autographs got drafted. That’s crazy, unbelievable." Roger Dean is home to both the Cardinals’ and Marlins’ affiliates; the park offered twice the fun, just as in the spring. Lynch said that a season ticket for their combined 140 games cost about $150 in those days, and the boys would get them as Christmas presents. "The Florida State League isn’t exactly the highest-attended minor league," Lynch said. "You really would get to meet and hang out with all these guys — pre-game, rain delays, they’d be just hanging out, like normal people. 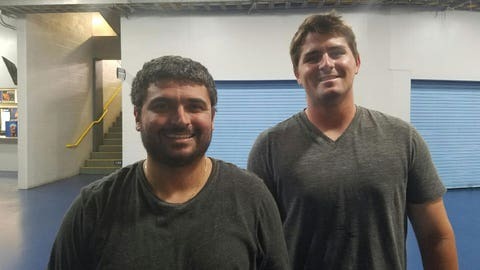 Jay Bruce, Joba Chamberlain, Jeff Samardzija and Francisco Cervelli all passed through the Florida State League at the time. Albert Pujols, then with the Cardinals, and Miguel Cabrera, then with the Marlins, trained in Jupiter in the spring. Lynch said he collected more than 100 Cabrera autographs — and more than 20,000 signatures in all. It was during this period that he met Kusnick, who was just starting out as an agent, representing Cain and others. Kusnick, it turned out, also was a collector; he actually had sold autographs before he was an agent. He, too, had 100 Cabreras and more than 20,000 total signatures — including those of the late Hall of Famers Cy Young, Ty Cobb, Jimmie Foxx and Rogers Hornsby. "Those games can get long, especially when you’re watching 140 of ’em over an entire summer," Lynch said. "We’d sit in the stands with 50 or 75 other fans. (Kusnick) would talk about when he used to get autographs. We would share stories about us getting autographs. 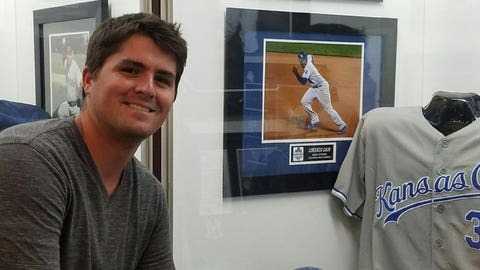 "He was kind of like, ‘If any of you guys ever make it, hit me up, we can work together.’ That was every one of our dreams, a bunch of little nerdy card collectors, 13-14-15 years old." Collecting, you see, wasn’t Lynch’s only boyhood passion. When he wasn’t chasing down autographs, he played the game, too. Motte stayed in touch with Lynch, later visiting him at Southern Mississippi, where Motte’s wife, Caitlin, had been director of operations for the women’s basketball team. A guy that was asking for autographs got drafted. That’s crazy, unbelievable. For some reason, Kusnick also had kept Lynch’s number on his cell phone — not under "Tim Lynch," but under, "Tim Autograph Collector." 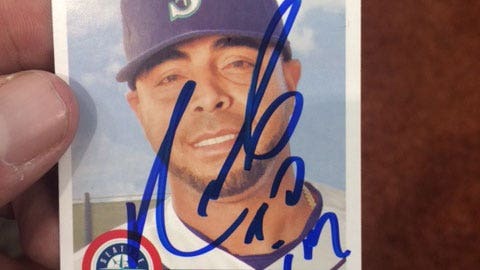 Lynch shows off one of his autographed Nelson Cruz cards. "I said, ‘This is the opportunity I was offered, what do you think?’" Lynch said. "At first he was like, ‘No way.’ He couldn’t believe it. When you think of an autograph-card collector, you don’t exactly think of the most athletic person in the world. Us collectors have that stereotype. "Professional baseball, we probably talked about for five minutes. The next thing you know, we’re having a 45-minute conversation. ‘What is your most recent autograph?’ There was more talk about that than any baseball stuff." Kusnick advised Lynch not to sign with the Dodgers — it was already late in the minor-league season, and Kusnick reasoned that Lynch likely would get the same opportunity or better if he had a good senior year at Southern Mississippi. I’d be happy to sign for him. I love to hear about players who love the game the way he does. "I’ve never prepped for a draft on 48 hours’ notice," Kusnick said. "I had nothing to do with his draft process beyond maybe talking to two scouts." 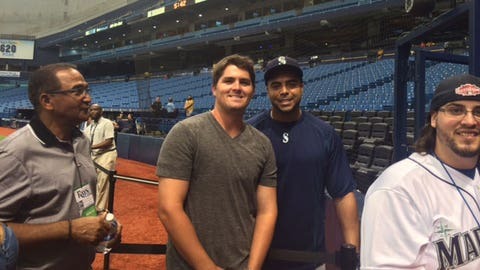 Lynch had his first day of work as a professional baseball player Wednesday, participating in a simulated game at the Yankees’ training complex in Tampa, Fla.
Lynch’s first question to Kusnick after the Yankees drafted him was if he could perhaps now get the autograph of the one superstar who eluded him during all of his years chasing autographs in Jupiter — Alex Rodriguez. "I’d be happy to sign for him," Rodriguez said. "I love to hear about players who love the game the way he does."